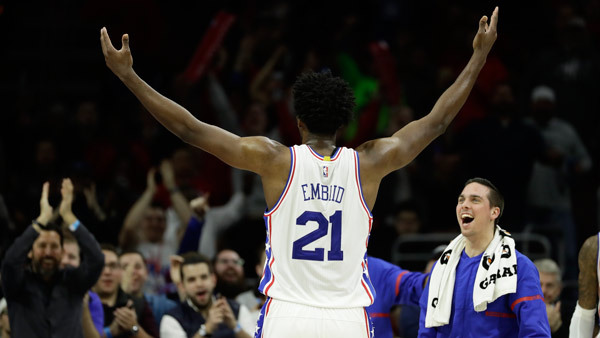 PHILADELPHIA (WPVI) -- You can trust the process with Joel Embiid for five more years as the Philadelphia 76ers officially announced the star's contract extension Tuesday. The new contract extends Embiid through the 2022-23 campaign. League sources told ESPN on Monday the 76ers and Embiid agreed to a five year, $148 million designated rookie scale maximum contract extension. Based on the details of what sources are describing as a complex contract structure, the 76ers would have to waive Embiid for him not to reach the full value of his $148 million extension. Embiid celebrated the new deal with a tweet. "I'm so thrilled to be in this position," Embiid said in statement. "I want to thank ownership, management, the coaches and most of all the fans, for supporting me throughout this whole process. I love this city and I'm so, so, so, so excited to be spending my next five years here and hopefully the rest of my career, God willing. Trust 'The Process.'" Embiid appeared in 31 games (all starts) in 2016-17, averaging 20.2 points, 7.8 rebounds, 2.1 assists and 2.5 blocks in 25 minutes per game. He shot .466 from the field, .367 from three-point range (ranked fourth among all NBA centers, min. 70 attempts) and .783 from the free-throw line. He led all rookies in points, rebounds and blocks per game and his averages in those categories were the highest of any NBA rookie since 2011. The Cameroon native scored 20-or-more points 19 times in his rookie season, which led all first-year players. Embiid was originally selected by the 76ers with the third overall pick in the 2014 NBA Draft after one season at the University of Kansas. As a freshman, he was named Big 12 Defensive Player of the Year and Second Team All-Big 12. ESPN contributed to this article.